About: Cancer Research UK is a charity which raises money for cancer research. 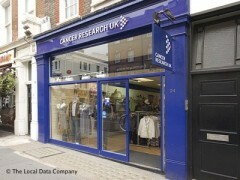 The company was formed as a result of the merger between The Cancer Research Campaign and Imperial Cancer Research Fund. Their chain of charity shops sell second hand items such as clothes, books and records to raise money. They will accept any donations provided they are in saleable condition. This particular branch is noted for its collection of designer clothes.